We are happy to announce that we have a new seamless integration with Close.io that gives you the possibility to send and track your sales documents with a single click. Insight-driven sales has never been so simple. Or beautiful! Have you ever wondered what's happening to your documents after you press the send-button? With one click from your lead inside Close.io you can send your sales documents and get real time insights directly back to the lead. Just click on the link to start the eSigning workflow from Close.io. All data will be added into GetAccept so the only thing you need to do is upload the document. After adding your document you can record and upload a personalized video using the GetAccept mobile app. This makes your document stand out from others and keep you top-of-mind in important sales processes. GetAccept will automatically help you to push the deal forward towards a decision. All events connected to the document will be added as notes on the lead in Close.io and you can always click your way to the document directly. 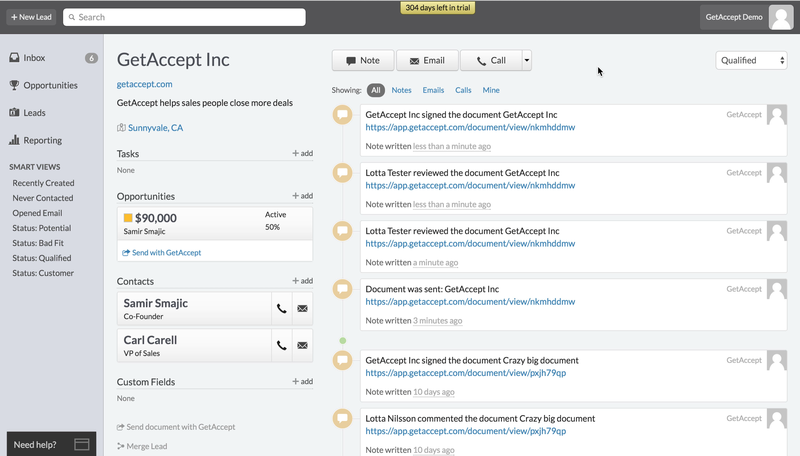 If a document is getting eSigned it will always be available from the lead in Close.io. All sent sales document are beautifully organized and you can see the process of every sent document in real time and even analyze how long each pages has been viewed. Deep insights creating a powerful sales advantage. Catch a lead in the moment they’re thinking about you, and be prepared to focus in parts of your proposal that caught their attention. GetAccept will help you to push the deal forward by taking different actions based on the activities from the recipients. 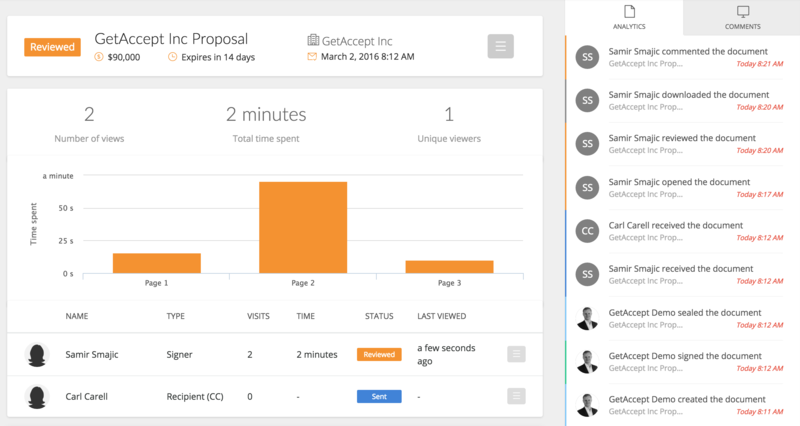 GetAccept support among other things email reminders, SMS links to document, auto-chat-dialogue and targeted remarketing campaigns to decision makers and influencers. When the lead is ready to say YES they eSign the deal. Simple and secure directly in GetAccept.